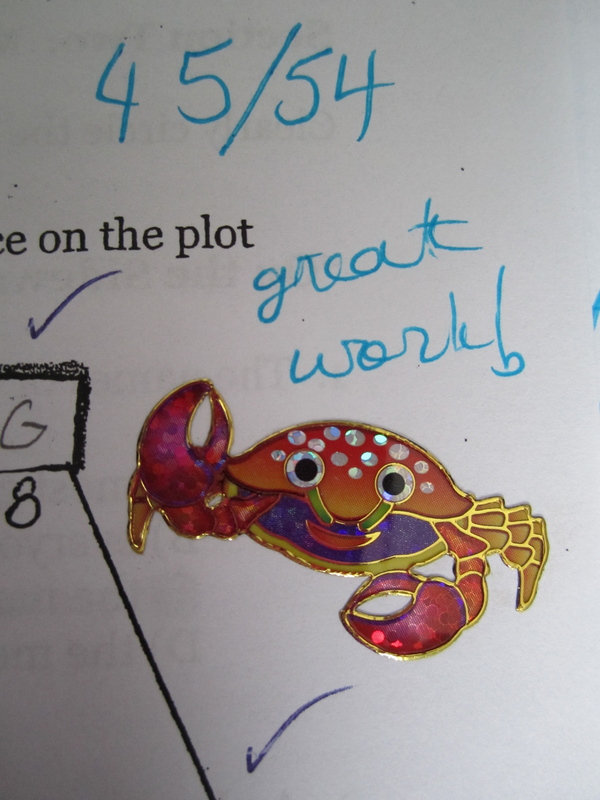 Although I teach junior and senior high, I still use stickers to reward good work. My general system is a big sticker for 80% plus and a little sticker for 70% plus. I also have some big honkin’ stickers for the rare but possible 100% achievements. The stickers I guy tend to shimmer or sparkle, and most feature cutesy-poo animals. 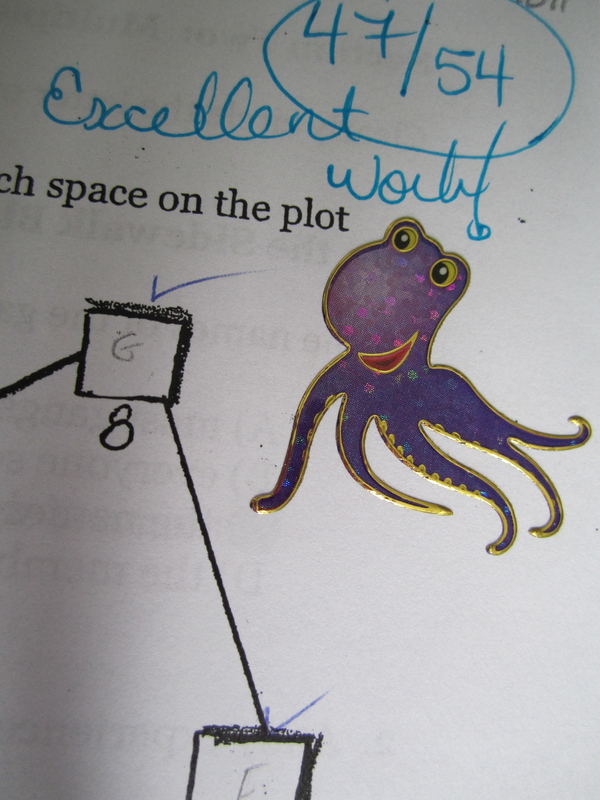 Jolly octopus says, "Well done!" It can be tough to find animals that aren’t too second grade since, after all, many of these kids are old enough to (gulp) drive automobiles. Sea creatures are always a hit, and right now, I’m milking that popularity for all it’s worth. Happy crab plays the castanets and brings that fiesta feel. Apathetic penguin wonders why he got out of bed today. In the world of my sticker ziploc baggie, where creatures from all walks, flaps, and swims of life live in peace and sing Beatles’ songs in four part harmony, this penguin doesn’t really fit. Seriously, even the freaking tyrannosaurus is grinning (maybe because he’s fuchsia) and the penguin cannot find anything to be happy about. The penguin, however, might have a decent reason for not giving a damn. Perhaps he is depressed because it’s even colder in his homeland than it has been this week in Alberta, and that’s really saying something. Maybe he has a little seasonal affective disorder pressing down on his feathered spirit. I saw March of the Penguins; I can appreciate how even the perkiest bird might be a little down after month after month of blizzards in the dark. 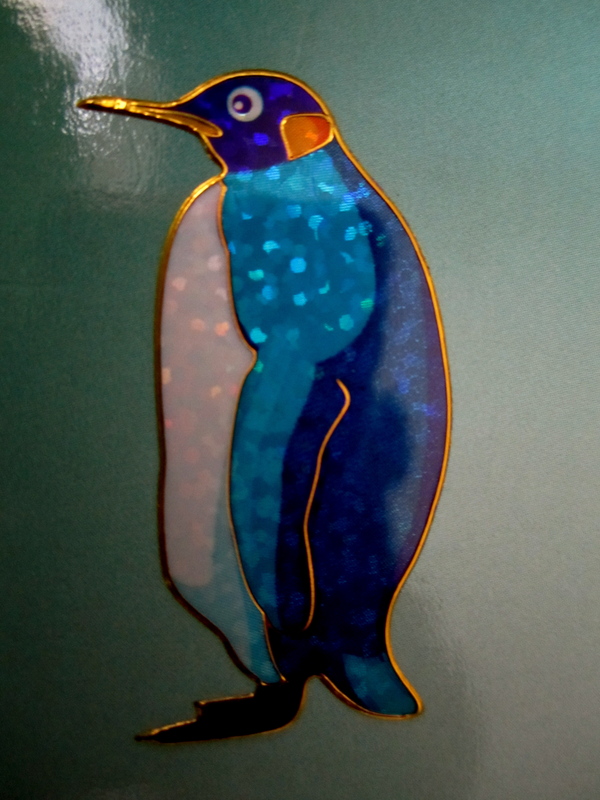 Maybe his favorite lady penguin ran off with his buddy Randy, who, incidentally, looks just like him. I don’t know. Whatever it is, apparently the situation is dire.